You really shouldn’t be reading this… because a few months ago, I died. At least, temporarily. With a bit of luck, I came back. Last August, while in the laundry room of my apartment building, my heart suddenly stopped and I collapsed. There was no medical rationale for this phenomenon. Like anyone, and perhaps even more than most, I have some medical issues. But none of them contributed to my cardiac arrest. My story isn’t uncommon–sudden cardiac arrest happens to 35,000 to 45,000 Canadians every year. It could happen to you. It was sheer luck that my building’s superintendent was in the room. He called 911, and with guidance from the operator, performed cardiopulmonary resuscitation (CPR) on me. By doing this, he bought extra time until paramedics arrived and used a defibrillator to jump-start my heart. Doing this saved my life. That 911 operator had asked my superintendent if there was an automated external defibrillator (AED) in the building. He admitted there was not. Had my apartment stocked an AED onsite (as it now does), my chance of survival would have been much higher. Many others are grieved annually because they didn’t have the luck I had. After someone’s heart stops, each minute defibrillation is delayed their chance of survival drops by 7-10%. After just 12 minutes, an adult’s survival rate is less than 5%. If your heart were to stop, and there is any delay before someone finds you, calls 911, an ambulance is dispatched and travels to your location, your may not have a chance of survival. That’s why it’s vital that AEDs become prevalent in our businesses, houses of worship, apartment buildings, and even our homes. AEDs are easy to use by anyone–they deliver clear voice prompts to guide their use and require minimal maintenance. I’ll be honest; my unexpected experience was terrifying and not just for me. My friends and family were understandably horrified, especially since I was only 29 when this occurred. The board, volunteers, and other stakeholders in the registered charity I run, BullyingCanada, were shocked. It’s still hard for all of us to grapple with this–even six months later. None of us imagined I might not be here tomorrow. We hadn’t yet done the succession planning required to ensure BullyingCanada will be around to provide support to the many tens of thousands of bullied Canadian youth who depend on us each year. 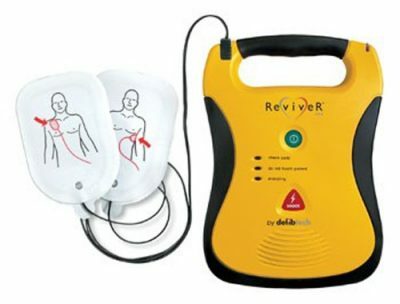 Life-saving AED technology is readily available and inexpensive, but it isn’t yet commonly stocked in all public places. Perhaps one deterrent is the $100 fee required to register an AED in the Ambulance New Brunswick registry. Why is there a cost to do so? Unlike other provinces where this registry is publicly accessible and is programmed to alert emergency dispatchers to the location of the nearest AED, our provincial government has not implemented this. Besides, Nova Scotia and Prince Edward Island are implementing software that alerts AED owners of nearby emergencies and requests they rush it over to the scene. This is easy and will no doubt save lives that would otherwise be lost needlessly. My near-death experience was a big wake up call for me and those connected to me. I hope it is one for you as well. Join me in advocating for the broad implementation of AEDs–including common sense legislation requiring one in all public buildings–and a public, interactive registry. One day, an AED might help keep your family complete, as it did with mine. This article was originally published by BullyingCanada. Rob Benn-Frenette, O.N.B. lives with his husband in Fredericton, New Brunswick and is the co-founder and co-executive director of BullyingCanada, Canada’s national anti-bullying charity.